Treatment of MS-related symptoms is a complex, individualized process and the development of universally-agreed upon quality measures or guidelines has proved extremely difficult. Symptomatic management involves widely different treatment strategies for individual patients, some pharmacologic and some non-pharmacologic. While many pharmacologic therapies used to alleviate symptoms of MS are approved to treat those symptoms, few agents for symptomatic relief, however, have been studied specifically in patients with MS. Many of these therapies come with their own associated sets of benefits and risks. Therefore clinical assessment and defining the success of these treatments often relies on data points derived outside MS, qualitative input and/or adverse events. Compounding this issue is that symptoms of MS cross so many disciplines of medicine, that many clinicians do not have the appropriate foundation or evidence to assess and implement improvement strategies in many of these areas. Thus, management of MS-associated symptoms represents one of the most challenging clinical aspects of the disease. 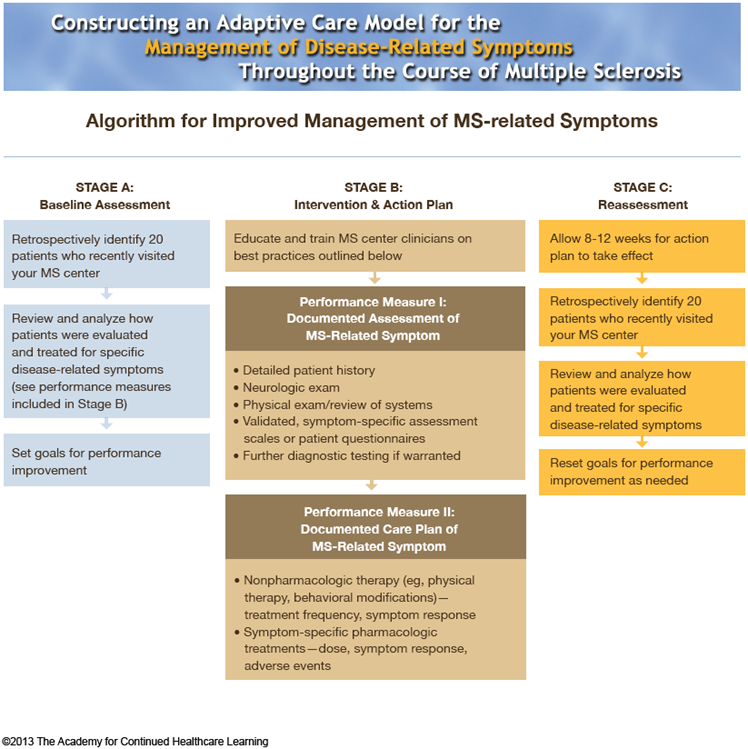 To address this challenge, a performance improvement CME activity was developed to help clinicians in multiple sclerosis centers improve the management of MS-related symptoms. This toolkit was developed based on the PI CME activity and provides clinicians with additional MS tools, resources and strategies to implement their own performance improvement activity. This PI CME activity was co-sponsored by The Academy for Continued Healthcare Learning, PeerView Institute, Purdue University College of Pharmacy, and supported by an educational grant from Acorda Therapeutics. If desired, set new performance goals again and repeat Stages B and C to reach desired outcome. Below is a list of resources and activities available to MS centers and clinicians, for implementation as part of Stage B. Please select the education to include in action plans based on what is most relevant to your needs, and the actions that you feel will be most helpful in achieving the goals identified. This is not a comprehensive list of resources or interventions available for Stage B; you may determine other education or action plan components that are more relevant based on your specific performance goals. The information included in this toolkit was prepared by The Academy for Continued Healthcare Learning (ACHL) and faculty members as outlined in the Introduction.